Ever since Microsoft took over the Lumia smartphones brand from Nokia they have been a bit aggressive with the Windows smartphone category in the Indian market. They are continuously bringing good Windows mobiles one after the other to India. Another one in the Lumia series, which we just reviewed, is the Microsoft Lumia 640. Read on to know more about this mid segment offering from Microsoft. 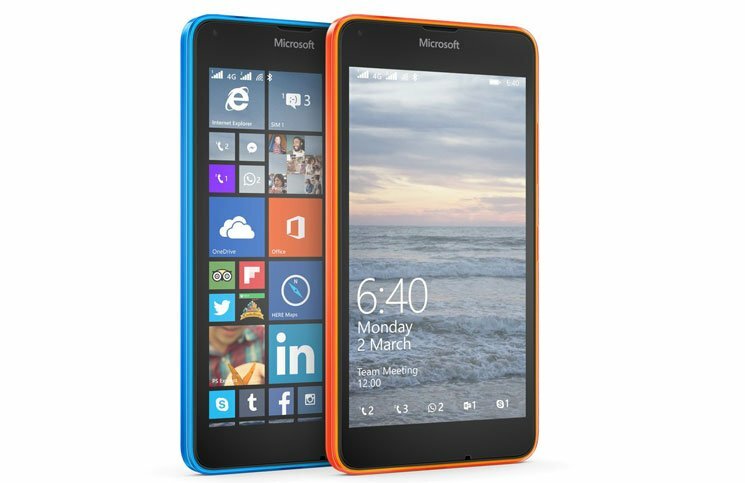 The Microsoft Lumia 640 is available in an array of colours, which include orange, white, matte black, blue etc. We got our hands on the orange one to review. The Lumia 640 design is distinctive and colourful. It has a bright coloured plastic body (which we quite liked). The Microsoft Lumia 640’s body has a soft rectangular shape display with high gloss finish. This mobile phone has rounded corners, which gives a good look to the phone. The 5-inch display has vibrant colours and we loved every bit of it. This IPS LCD capacitive display comes with 16 million colours. The screen has Corning Gorilla Glass 3 over it for protection. The mobile phone is 8.8mm thick and weighs 145g. The minimalistic design of the mobile phone is very impressive. At the back of the mobile phone, we have a removable plastic panel that fits well with the frame. Under this removable plastic panel, there is a removable battery, two Micro SIM card slots and a Micro SD card slot. Also at the back, Microsoft has installed a loud speaker at the bottom right of the mobile phone. The power button is located on the right side of the phone along with the volume key. The USB port is located at the bottom of the phone and the 3.5mm headset jack is located at the top of the mobile. The primary camera is on the top left (rear) of the mobile phone, which comes with the LED flash. A neat pair of headphones also come in the box. The Microsoft Lumia 640 has the 1.2GHz Cortex-A7 Quad-Core processor that comes along with 1GB of RAM for applications and services. The users also get 8GB of internal memory to store files. This we feel could have been slightly more. However, there is the option to add up to a 128GB microSD card to store additonal files. All this runs on the Qualcomm MSM8926 Snapdragon 400 chiptset. For graphics an Adreno 305 is also on board. Other features includes Gyroscope sensor, Accelerometer sensor and Compass sensor. The mobile phone also features HTML5 for browsing. The primary camera of Microsoft Lumia 640 comes with auto focus and can capture 8-megapixel still images along with HD videos. For selfies, there is a 1-megapixel secondary camera. The camera captures very decent pictures, but in low light and dark areas, the picture quality was not up to the mark. Macro shots on the other hand were quite good. The mobile phone runs most of the apps without any hassles. But, one can’t play high end games on this device. We faced no problems when it came to audio and call quality on the Microsoft Lumia 640. The supplied headphones are really nice. Screen, image and video quality is also above average. Moving on to its battery life, the Microsoft Lumia 640 has 2,500 mAh interchangeable battery inside it. It worked for 19 hours after a full charge (under nominal use). We tested the phone with AnTuTu Benchmark and it managed to score 11,983 points, which is a nice score for this mobile phone in the mid segment of smartphones. The Microsoft Lumia 640 has some great features in it. It comes with Microsoft Windows 8.1 with Lumia Denim update. This mobile phone has an impressive display, which comes with many vibrant colours. The experience was pretty much smooth throughout. People can get the mobile phone for Rs 8,999 at any online retail store. We must conclude it’s a great deal at this price. Only if Microsoft had added 16 GB of memory instead of 8 GB it would have been a steal.